When you're enjoying the great outdoors, keep your food and camping gear dry and protected with the NRS Canyon Camping Dry Box. The sturdy and economical solution you've been waiting for. 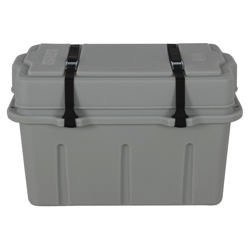 Lighter and less expensive than other dry boxes, the NRS Canyon plastic dry box will keep your stuff dry and protected on your boat, in camp, and on the road. Picnic basket size is perfect for bread and chips or a cook kit. Fits easily in the trunk of a car. Engineering-grade polyethylene construction will take many years of use and abuse. Multiple tie-down points make it easy to secure the Canyon Box to your boat, luggage rack, truck or trailer. 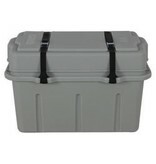 Includes two easy-to-use heavy-duty compression straps that ensure a tight seal between the lid's foam gasket and the box, keeping your stuff dry in splash and bad weather. Not intended for submersion or for protecting valuable electronics.